San Casciano in Val di Pesa is a quiet Tuscan country village, sitting on the top of a hill, surrounded by the green of Chianti's landscape, a few kilometres south of Florence, Italy. San Casciano in Val di Pesa is also a comune (municipality) that is part of the Province of Florence and it is also part of Chianti, an agricultural area in Tuscany famous for its wines, extra virgin olive oil, genuine and organic food, culture and landscapes. 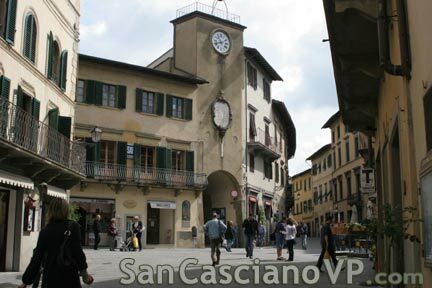 All the information to get to San Casciano with or without a car, arriving by plane, train or car. The town and the surroundings offer many restaurants, trattorie and pizzerie where you can taste traditional Florentine and Tuscan food. The village has some good restaurants, pubs, bars and pizzerias. Several shops sell local products, like groceries, butchers, pastry shops, bakeries and a big supermarket by Coop. Many events are scheduled through all the year. You will also find all the services you need: banks with ATM, a post office, pharmacies. The location itself is very appreciated by the tourists who choose San Casciano as base for their holidays in Tuscany. San Casciano VP is indeed an excellent starting point for your excursion in other Chianti villages, in Florence (14 Km), Siena, Pisa and the other little Tuscan country villages. Thanks to the proximity to a dual carriageway that connects Siena to the motorway A1 Naples-Milan you can easily reach other italian cities like Rome (two hours and fifty minutes), Venice (three hours), Perugia (one hour and fortyfive min. ), Cinque Terre (one hour and half), Bologna (one hour and twenty minutes). From Florence you can reach all the main Italian cities using a fast train or a slow and cheaper train. For example, a fast Frecciarossa train takes you to Roma Termini (Rome city centre) in one hour thirtyfive minutes, an Intercity train in two hours and fifty minutes, a very cheap Regionale will take more than three hours and half. Travel into neighbouring Chianti villages is provided by public transport services. For those who want to visit Tuscany without a car: don't give in, San Casciano is connected to Florence by an intercity coach/bus service that will take you straight to the Florentine central railway station in half an hour. From there you can reach all Tuscany cities by coach or train.